Godspell is the story of Jesus and the community of believers he brought into existence. God's good news often sneaks into our lives on the wings of laughter, and that is the intent of this musical. It's a comedy ... and yet, if you listen, God speaks and we hear. On this page are the words to the songs, many of which are old hymns of the church with different melodies. Interspersed is a synopsis of what happens between the tunes. Links abound to those hymns and the scriptures upon which it all is based. Check it out! Some Christians take offense at using comedy to share the gospel story. Jesus and his disciples in clown outfits to them is too much. Remember, though, that Jesus himself was considered offensive to many religious people 2,000 years ago. His followers were fishermen, for heaven's sake. Everyone knows the tall tales they can tell. His parables stretched the faith, often in quite humorous ways. Finally, the cross was considered foolish business, at least in some eyes. If you cannot hear God speak through this musical (the words to which are heavily taken straight from the King James Bible) maybe you need to take the plank out of your own eye. Each production of Godspell is unique, for every group puts their own personal stamp on it. That's true of our rendition. We've added some elements, taken away others, placed a song in a different location, spread the lines and tunes around to different people - each of whom is gifted in their own unique way. This Godspell thus becomes the Gospel according to this company of believers who have come together at this moment in time to put it onstage. We are merely passing on what we have received, but doing so in our own dress - which is what the church has been called out to do everywhere. To say all this in a slightly different way - we are, like the apostle Paul, "fools for Christ sake." So rejoice with us, and laugh ... and live! Godspell begins with Jesus (offstage) declaring himself as God and King in whom there is no beginning and no end. The company (onstage) takes on the roles of different philosophers who debate the existence of the God. Their musical discussion disintegrates into an "ivory tower of babble" where ideas become only fragments. Even if I have to die many times. touch, opinion, sense, and name - and so on. Conversely, he is often missed in many. I may be just the German way, but God, it gives one pause. Man's filling of the void. I live on Earth at present, and I don't know what I am. An integral function of the universe. Oh, what does it matter if they don't agree? John the Baptist enters and prepares the way for Jesus, baptizing the company as they join in the song. At its conclusion, they quickly exit, leaving John alone. While John preaches repentance to the audience (Matthew 3:7-12), Jesus quietly enters, and then asks to be baptized. John kneels and wishes to be baptized by him instead (Matthew 3:13-15). Bringing John back to his feet, Jesus is baptized and proclaims - in song - that he is here to save humanity. The company returns in clown costumes and joins in the song and dance. Oh God of mercy, when? Their heritage a sunless day. That men shall toil for wrong? And songs be heard instead of sighs. Thy children as thy angels fair. God save the people from despair. Oh God save the people! O God of mercy when? For thine they are, for thine they are. source of words: "When wilt thou save the People"
Jesus gives to each of the company a special item which they wear until the end of the production. He assures them that he has come not to abolish the law of the prophets but to complete it, informing them that those who keep to the law of God will earn the highest place in heaven (Matthew 5:17-20). To illustrate this, he tells the story of the widow and the judge (Luke 18:2-8), which the company humorously acts out - as they do most of the stories. This parable shows that God is a good judge who will vindicate those who cry out to him day and night. Next comes the story of the Pharisee and the tax gatherer praying in the temple, to illustrate that every man who humbles himself before God shall be exalted (Luke 18:10-14). Even anger must be dealt with, Jesus says (Matthew 5:21-22), and the story of someone bringing their gift to the altar when a brother holds something against them (Matthew 5:23-26) is acted out as if it were an Olympic event. Then, all clapping in rhythm, they act out the story of a King who had a servant who owed him a great debt (Matthew 18:23-35). Asking for pity, the servant's debt was forgiven. However, the servant left and demanded repayment from a fellow servant, without showing the same compassion he had received. The king heard and condemned this unforgiving servant to prison. Jesus thus proclaims the importance of forgiveness. Judy then sings “Day By Day” which is a prayer for clear vision. The company joins in the song. source of words: "Day by Day"
After the song ends, Jesus preaches that if one part of the body offends, it is better to lose it than to have the whole of it thrown into hell (Matthew 5:27-30). In a series of vignettes, the company acts out Jesus' answers to such problems as “if someone slaps you on the right cheek...” or “if a man sues you for your shirt...” or “if a man asks you to go a mile with him...” (Matthew 5:38-42). Then comes a “Winnie the Pooh” puppet show of the Good Samaritan story (Luke 10:30-35) performed for Jesus, who then tells them to love their enemies and not to make a show of religion (Matthew 5:43-6:4). If good deeds are done in secret, the reward will come from God. The company performs the story of Lazarus and the rich man (Luke 16:19-31). Lazarus is a poor man who goes to heaven. The rich man goes to hell, where he begs to let Lazarus rise from the dead in order to warn his rich brothers of their eventual fate. Nicole, Terri, and Caitlin sing “Learn Your Lesson Well” in which they warn of eternal doom if one does not learn what God desires. And they're actin' like a pack of fools. 'Stead of studyin' the good Lord's rules. There's gonna be a quiz at your ascension. But if you're smart you'll learn your lessons well! You can reach it if you keep alert. May not help you, but it couldn't hurt. First ya gotta read 'em, then ya gotta heed 'em. "You better start to learn your lessons well!" Jesus tells the company that no one can can serve two masters - God and money (Matthew 6:24). Following the story of a man who spends his life accumulating things and then dies before he can enjoy it (Luke 12:16-20), Christine then sings “Oh Bless the Lord, My Soul” in which she praises a patient and wise God. The cast joins in on the song and dance. His praise to thee proclaim! To bless His holy name! His mercies bear in mind! The Lord, to thee, is kind. source of words: "O bless the Lord, my soul,"
Jesus bids the company to put away thoughts of material things and anxieties about tomorrow (Matthew 6:24-34). The company recites the beatitudes (Matthew 5:3-12), and Jesus answers them in a call-and-response manner. However, Judas recites the final beatitude about persecution and directs it at Jesus. The company freezes with fear about possible events to come. However, Jesus quickly changes the subject and sings “All for the Best,” through which he assures everyone that even if life is bad, their reward will be in heaven. Al sings a verse of the song as well, and he and Jesus perform a soft shoe dance. The company joins in with canes in hand and feet moving. Don't forget that when you get to Heaven you'll be blessed! source of words: "We plow the fields and scatter"
Using a take-off of the TV game show, "Family Feud," the Caan and Carnegie families then try to win by naming as many of the 10 commandments (Exodus 20:1-17, Deuteronomy 5:6-21) as they can. The losers reject the consolation prize and all fight for the "pearl" the winners receive, about which Jesus has a few things to say (Matthew 7:6). The company then acts out the story of the prodigal son (Luke 15:11-32), after which the father and his two sons in the parable sing "Beautiful City." This song was written for the 1973 movie adaptation of Godspell. For more info, see the musicalschwartz.com page about it. The lyrics for this song do not come from scripture. In rap style, Jesus tells of how God desires to give his children "good things" (Matthew 7:9-12). Act I ends in black-light and white gloves with “Light of the World,” a song which encourages everyone to be shining beacons in the world. As the band plays on, Jesus then announces a ten minute break and thanks the audience for coming. The cast returns onstage, with Russ, Mark, and Al (in wigs and 'feminine' voices) humorously singing a reprise of “Learn Your Lessons Well.” Afterward, Terri comes up through the audience singing “Turn Back O Man.” Jesus joins her in the song, and the company joins in the dance. C'mere Jesus, I got something to show ya! source of words: "Turn back, O man, forswear"
Cast members then become Pharisees who question Jesus’ authority in a variety of ways, and he responds (Matthew 21:23-32; 22:16-21, 36-40; 23:1-10). In the song, ”Alas for You,” Jesus scorns the Pharisees and calls them hypocrites, turning over the tables upon which they had been sitting. Twice as fit for hell! Drag them down with you! You cannot escape being Devil's food! Shall bear the guilt of it all! Alas, alas alas for you! At the Wailing Wall in Jerusalem, Jesus predicts that he will not be seen again until a future time (Matthew 23:37-39). He remembers the days of Noah when the flood swept over the land and drowned humankind (Matthew 24:4-8, 37-44). He predicts that when he comes again, only one man and one woman will be taken with him. The rest will be left wailing outside the kingdom of God. Acting out a story of 3 servants left in charge when their master goes away (Matthew 24:45-51), the cast discovers which one remains faithful when the show host asks, "will the real D. Trusty Servant please stand up." Caitlin is thrown down onto the stage and called an adulteress. Jesus tells the company that the one who is faultless can throw the first stone at her. When no one condemns her, Jesus tells her that he will not condemn her either, but she must not sin again (John 8:3-11). She then sings, “By My Side,” asking Jesus to travel with her. I can walk and walk! "What will you give me to betray Him to you?" They paid him thirty pieces of silver. Following the reminder of Judas' betrayal within the song, Jesus tells of a time when he will sit in glory and divide men into two groups like a shepherd divides the sheep from the goats. His righteous sheep will enter heaven while the cursed goats will face eternal fire (Matthew 25:31-46). The goats beg for mercy, and Al sings “We Beseech Thee,” with the cast then joining in the song and dance. We beseech thee, hear us! source of words: "Father, hear thy children's call"
When the song is over, the company sings a reprise of “Day By Day” as they return to Jesus what he had given to them at the beginning (all except Judas, who keeps his whistle). Jesus announces that one of the company will betray him, and then tells Judas to do quickly what he must do (Matthew 26:20-22, 25; John 13:27). Judas runs off. Then, after a prayer (Matthew 6:9-13), Jesus shares with the rest the bread and wine, and announces that it is his body and blood. They will all eat and drink together again in the kingdom of God (Matthew 26:26-29). While the band sings and plays “On the Willows,” the cast share their goodbyes with Jesus - one by one. Jesus then prays in the garden (Matthew 26:31-42). In a moment of uncertainty, he begs for the burden to be lifted from him and is tempted by the devil, but he orders the devil to be gone (a reprise of Matthew 4:1-11). “Long Live God,” one voice sings after the silence, then another, until all join in. “Prepare Ye The Way of the Lord” comes in as a counter melody while the company removes Jesus from the fence and carries him off. "And on the third day Jesus rose from the Dead, in fulfillment of the Law and the Prophets." The company then reenters onstage for bows with a reprise of "Day by Day." Does Godspell tell the whole story of Jesus? No. In fact, as a narrative, it's more a series of vignettes and less a play with a consistent plot. For source material it relies heavily upon the teachings and parables of Jesus as found (if you note from the above scripture references) primarily in the gospel of Matthew and some from Luke. Missing are his healings and other miracles. It doesn't tell the whole story. Jesus and the church he brought into being are bigger than any retelling, otherwise why would we have four canonical gospels (Matthew, Mark, Luke, and John) instead of just one? The other parts of the story? Well, isn't that why God's people gather together on a regular basis, to remember? A major question raised about how Godspell ends concerns the resurrection. 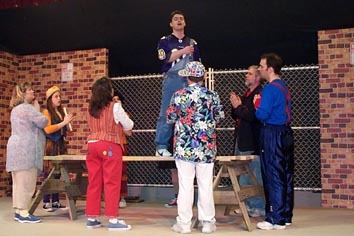 Jesus is cut down from the cross (a fence) and carried offstage while the cast sings "Long live God" and "Prepare ye." When does Jesus rise? - an important element of Christian belief. Some point to this (among other things) as evidence that Godspell is "a slap-stick, harlequin, blasphemous musical supposedly based upon the gospel according to St. Matthew," produced by "the hippie counter-culture." We just plain don't believe this is so. A comedy? Indeed! Blasphemy? No! Our production chose to end (as it begins) with the voice of Jesus - at this point paraphrasing the words of the apostle Paul (1 Corinthians 15:4) on the resurrection. That's just our "take," one of the ways we have put our own stamp on this musical. According to composer Stephen Schwartz, "Godspell is about the formation of a community which carries on JESUS’ teachings after he has gone. In other words, it is the effect JESUS has on the OTHERS which is the story of the show, not whether or not he himself is resurrected." Regardless of if or when you sense the risen Christ in this production, the important point is this - what will you do with what you have seen and heard after you leave? When all the bows have ended, our cast steps into the audience (or is it a congregation?) and finishes with the "Day by day" that we all face. The community drawn together by Christ, thus, is not the actors on stage, but the people who then go forth to live. ... "Prepare ye the way of the Lord!"